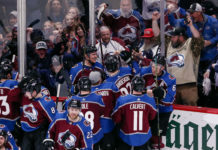 On the back end of a two-game homestand, the Avalanche escape with two points against the Arizona Coyotes to sit a little more comfortably in the final wild card spot in the Western Conference. 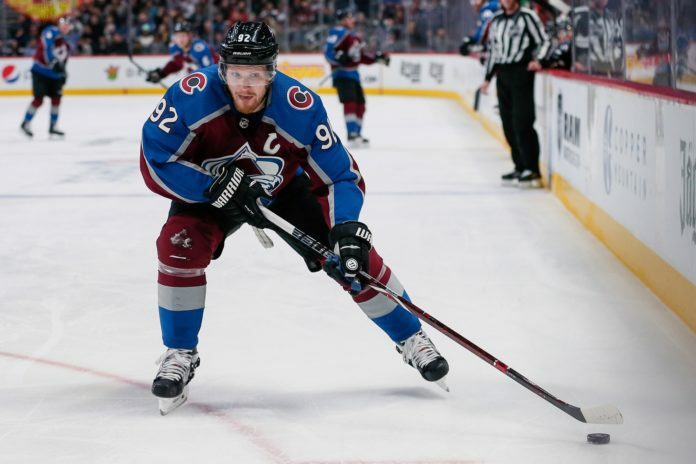 Captain Gabriel Landeskog made his return, setting up star centerman Nathan MacKinnon to open the scoring. Landeskog’s assist gives him 70 points on the season, the first time the forward has reached the mark in his career. Colorado added another power-play goal nearly six minutes later to take a multi-goal lead into the final period. It was all Arizona from there. The Coyotes outshot the Avs 20-7 in the final period, adding two goals in the final eight minutes to force overtime. 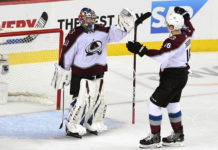 After five minutes of scoreless hockey, the Avs won the shootout after goaltender Philipp Grubauer went a perfect 3-for-3 and MacKinnon scored the lone goal. What did we learn from the win? 1. Special teams were a factor tonight. Colorado survived off a strong first period from the Coyotes, which included three minor penalties against, all of which were killed. In the second period, the Avs used two straight power play opportunities to take a 2-0 lead in the final moments of the period. Colorado was 2-for-4 on the power play against the number one penalty kill in the league. 2. Colorado scored the first goal of the game for the eighth straight game. 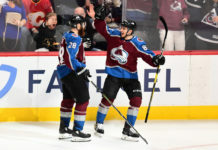 After spending nearly two months falling behind and coming up short in comeback attempts during the middle portion of the season, the Avalanche has found a way to score the always important first goal for the eighth straight game (6-1-1). The Avalanche has not trailed at any point over the last seven games. 3. Grubauer is leading Colorado’s playoff push, and he’s here to stay. Is it safe to say Grubauer has found his groove with the Avs yet? The veteran netminder led the eventual Stanley Cup champion Washington Capitals into the playoffs a season ago and he’s doing the same for the Avalanche this year. After making 42 saves tonight, Grubauer is 6-0-1 in his last seven games with a 1.57 goals against average, a .957 save percentage and two shutouts. 4. Colorado controls its own fate heading into the final four games of the regular season. Thanks to regulation wins against Minnesota and Chicago and holding Arizona to just one point tonight, Colorado has put three points between 8th and 9th in the west. With four games remaining, the Avs control their own fate towards a second straight playoff appearance. 5. The Avalanche’s depth forwards are pitching in offensively. Over their last 10 games, the Avs have goals from nine forwards outside of MacKinnon, Landeskog and injured top line winger Mikko Rantanen. From the 12 forwards that played tonight, Matt Nieto is the only one without a goal during this stretch. The veteran winger returned to the lineup on Wednesday. Colorado continues its playoff push on the road, traveling to St. Louis to take on the Blues at 6 PM MST on Monday. The Blues are four points back of first in the Central Division, but have won just five of their last 10 games.